Facial Package is now available! Facial requires appointment. Only availble Monday - Friday. Just extra $10 you can have hot stone for the back! Majestically gracing the White Flint and Rockville Pike is our serene and sophisticated Massage Spring Spa, Rockville.We pamper our clients with a Signature selection of facial treatments and massages.Our highly experienced massage therapists will redefine and demonstrate the true meaning of "relaxation".Come visit our Massage Spring Spa for the quintessential health and beauty spa experience. 60min Relflexology For Only $49! 60min Accupressure For Only $49! 60min Sport Massage For Only $59! 60min Back Massage For Only $59! 60min Swedish For Only $59! 60min Deep Tissue For Only $59! 90min Hot Stone Massage For Only $108! 60min Sport Massage For $98! 60min Back Massage For $98! 60min Deep Tissue For $98! 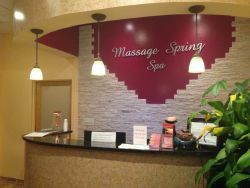 90min Hot Stone Massage For $196! If rockville is not convenient for you.We also have a sister location at Washington D.C. Our membership applies to Massage Spring D.C. as well.